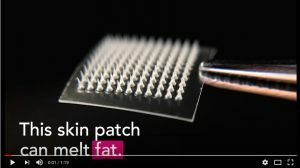 a Chemical compound was introduced through microneedles on a patch by researchers at Columbia University Medical Center (CUMC) and the University of North Carolina. This resulted in the conversion of stored white belly fat to brown fat in mice. Disclaimer: Slim.co.za (and Sandra) are not responsible for the accuracy of news releases or articles posted by third parties or contributing institutions. All information provided for information & education purposes only. Nothing published on https://slim.co.za is intended as substitution for medical advice, diagnosis, or for any treatment.